I’m well and truly over the virus I had over New Year… and the accompanying anxiety. My blood counts remain good. I don’t even look at the results now. The result of the most recent serum-free light-chain test (the test for my type of myeloma) had not yet come back at my last clinic visit, probably due to the winter holidays, but I’ve not heard anything since, so it’s probably the same as the last one, in which the myeloma was undetectable. They will continue to test every two months, so any relapse will be spotted in good time. I’m aware that many of my fellow myeloma buddies who are in remission get very anxious each time they have a blood test or clinic appointment. Fortunately, so far, I don’t experience any anxiety, but that may change in the future, when clinic visits are further apart and therefore become more of a ‘special event’. The last chimerism test showed 100%, i.e. the donor cells have completely taken over my immune system. Chimerism can fluctuate, so they continue to test every 3 months for two years. They did a chimerism test at my last clinic visit, from which I’ve also not had any results, but I’m not at all concerned about it. Even though I know it can be otherwise, I expect it to stay at 100%. To be honest, I don’t even think about it. A leukaemia patient I see in clinic, who is six months post-transplant, told me she hasn’t achieved 100% chimerism, so she will be having a “top-up”. This is the colloquial term for a Donor Lymphocyte Infusion [DLI], where they give an infusion of lymphocytes (white blood cells) from the same stem cell donor, without the need for chemotherapy and therefore a LOT less risky than a further full stem cell transplant. However a DLI can often cause more of a Graft versus Host reaction [GvHD]. Another leukaemia friend from clinic has not had any GvHD from her transplant eleven months ago, so she too may be facing a DLI in order to achieve not only a Graft versus Host response, but more importantly, a Graft versus Leukaemia response. In her case, they will need to ask the donor to donate again as they have already used his initial ‘donation’. She’s so greedy! For more information about DLI, I found a very informative leaflet published by Leukaemia and Lymphoma Research. I was tickled to see that it features on its cover, a photo of Prof Nigel Russell and Emma (stem cell nurse specialist) from Nottingham City Hospital. Fortunately, with 100% chimerism and some mild GvHD, I don’t need a DLI at this point, but it may be required if I relapse. I am also still receiving infusions of Zometa (Zoledronate) to protect my bones. Initially, I had it every four weeks, but after eight months, they only give it every eight weeks. I will have a total of 16 infusions over approximately two years. After that point, there is an increased risk of osteonecrosis of the jaw [ONJ], so they stop. Another issue is, as Wiki says: “Zoledronate is rapidly processed via the kidneys; consequently its administration is not recommended for patients with reduced renal function or kidney disease.” Fortunately, my kidneys have improved since I was first diagnosed, no longer a subject of concern. It’s a testament to their relatively good health that I can actually receive Zometa. I couldn’t even start receiving it until September last year because they were in such poor shape. I had Zometa infusion number eleven last week. Fortunately, it only takes fifteen minutes, plus a flush before and after, so I wasn’t in Daycase for long. 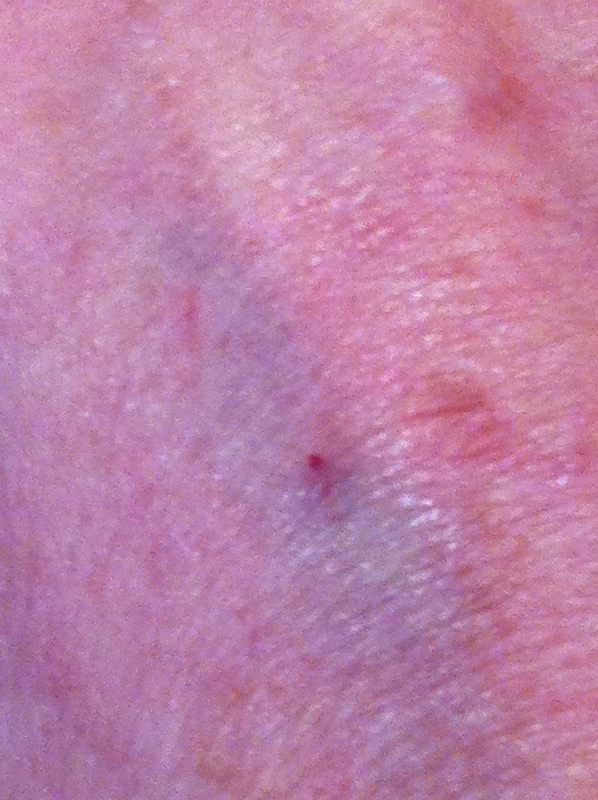 Annoyingly, I had that same irritating nurse, who although she cannulated me on her first attempt, managed to create a big blue tender bruise on my hand. Owwwww! My days of taking huge quantities of tablets are over for now. In the early days, I needed a chart to keep track of what to take when, at another point I had to buy an additional pill box just to contain them all. 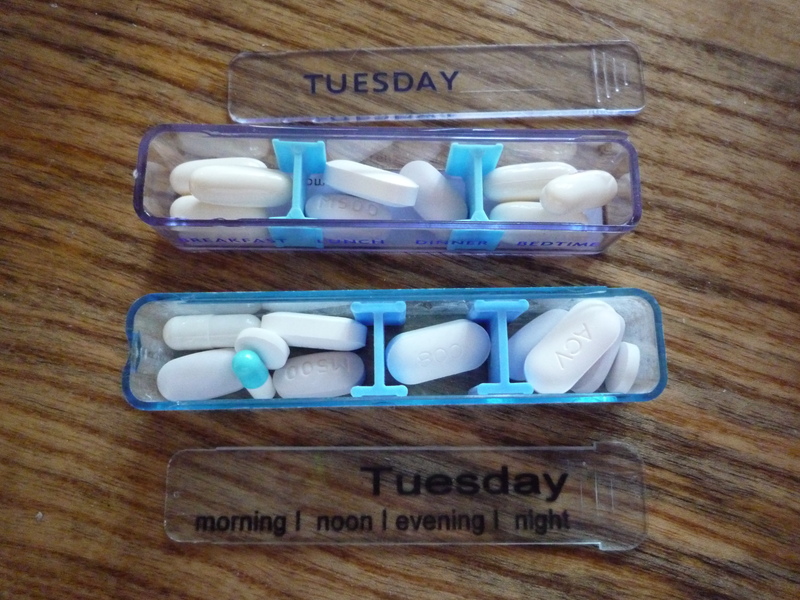 Now, it’s quite simple… just seven tablets a day – Aciclovir, Penicillin and Fluoxetine (Prozac). The major thing that is not okay is my mouth – I still have oral Graft versus Host Disease. I mentioned previously the various treatments we have tried to reduce the soreness in my mouth. None have had any impact at all. My mouth and lips still feel tight, sore, dry and very sensitive, especially to sharp tastes like pepper, chilli, vinegar, hot drinks/foods, crusty bread or crisps. And some everyday activities make me wince… flossing my teeth, yawning or when I accidentally jab myself with a fork when eating. From time to time I get blisters – on my tongue, inside my lips or cheek. Neither the sensitivity nor the blisters stop me from eating (heaven forbid! ), but they do affect my food choices and are an ongoing discomfort. It might improve… or get worse… or stay exactly the same. Nothing I can do about it! The worst of it is when I brush my teeth with a regular mint toothpaste. I do occasionally use a fennel one from the health shop, but while I like the taste and it doesn’t hurt my mouth, I don’t quite trust its efficacy for maintaining my teeth, which need all the help they can get. However, I will be seeing my dentist for a check-up tomorrow, so I will ask her advice. I probably need to mention, for the sake of complete honesty, that I am still having treatment for the genital warts. Without ongoing attention, they flare up again, despite the antiviral tablets. They aren’t really a problem, it’s just that I’d rather not have them, of course. I went to the GUM clinic again last week. I’m not wincing from the cryogun freezing as much now. And I don’t think any further details are required. There are some more minor issues, which include fatigue and low-level depression – yes, despite the antidepressants, which I am doing my best to accept (more on this later); difficulty getting to sleep and waking during the night, which may be part of the fatigue; a slight skin rash and blackheads on either side of my cheekbones, which I generally ignore for the most part and am hoping will disappear at some point. So, today is exactly eight months and one week post-transplant. It’s looking pretty good overall, but it is still early days. N.B. ‘Early days’ continues for the first two years. This entry was posted in * Myeloma and tagged Aciclovir, antidepressant, anxiety, blood test, cannula, cannulation, chemotherapy, chimerism, cryotherapy, dentist, depression, DLI, Donor Lymphocyte Infusion, fatigue, Fluoxetine, genital warts, Graft versus Host Disease, GUM, GvHD, immune system, insomnia, kidneys, Leukaemia, lymphocytes, Nottingham City Hospital, ONJ, oral GvHD, osteonecrosis of the jaw, Penicillin, Prozac, serum-free light chain, skin rash, stem cell transplant, teeth, transplant, Zoledronate, Zometa. Bookmark the permalink. I admire your perseverence, sorry about the yucky mouth stuff though! Thanks Morag. Not much choice in the matter really. We are all persevering though, aren’t we – that’s what life entails. Thank you so much for keeping us updated. I look forward to your posts. You are an inspiration. Thanks Suzanne. So glad to have you on board. Do I call you Suzanne or Kelley? So much medical detail there, and yet so much emotion lies just underneath. I wish you physical comfort in all the spots that hurt; and the emotional comfort that allows you to fall into a soft place and bounce back up, too. And I send hope for quality moments, hours, days, and years. I am amazed by the allo scts warriors. I had tandem auto scts. Keeping the allo in arsenal for later if needed. I admire you and your sunny attitude. Hoping you continue to feel better. Enjoy reading your blog and thankful that you share your thoughts and experiences with the world. It helps me to read your blog and know that I’m not alone in this fight. Stay strong and again thanks for sharing. Thanks Linda! You are certainly not alone. Sadly there are quite a few of us, but happily we connect and support each other. Stay strong too! Thank you for sharing so honestly, it really helps to know I am not alone and I wish you lots of emotional and physical strength along your journey. Of course you aren’t alone, Deborah. And it helps me to know I’m not writing into the void. Good to have you on board. It’s lovely getting to know you. If only it was under different circumstances, but it’s all going to be fine… well, it’s an interesting ride, eh?! Spoke to your Mum last night and she sounded quite good and pleased with the physiotherapist – she did listen to your advice about going with him (does not often listen to me even when I give her similar feedback) so it is good that she feels it could be helping.